Non enveloped virion, about 40 nm in diameter with a T=4 icosahedral symmetry (240 copies of two proteins derived from the capsid precursor cleavage). 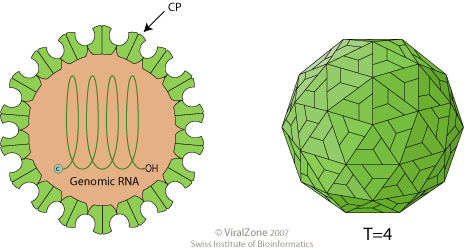 Monopartite (Betatetravirus) or bipartite (Omegatetravirus) linear ssRNA(+) genome of about 6.5 kb. The 5' terminus is capped in Omegatetraviruses but not in Betatetraviruses. The 3' terminus is not polyadenylated but terminates with a distinctive tRNA-like structure. The virion RNA is infectious and serves as both the genome and viral messenger RNA. Genomic RNA is translated into a polyprotein which is cleaved presumably by a viral protease into replication proteins. Replication produces a subgenomic RNA which encodes for capsid protein. Genomic RNA is translated to produce replication proteins. Expression of the subgenomic RNA encoding the capsid protein. NATURAL HOSTS Moths and Butterflies. ASSOCIATED DISEASES Infection outcome varies from unapparent to lethal.